Since you guys loved this series so much I just had to keep going with it. 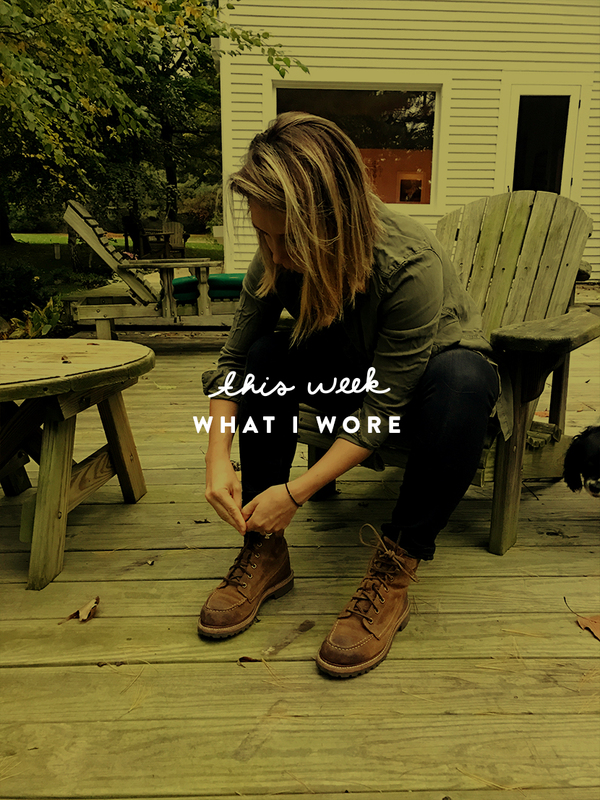 Granted, doing it every week is a little tedious, not because I don’t get dressed, but because I kind of lose track that I need to take a photo of my outfits. It gets busy around here, BUT because of the survey you guys told us you wanted to see more guys fashion too so Mike and I are going to alternate weeks. We both work off of a base wardrobe each season. 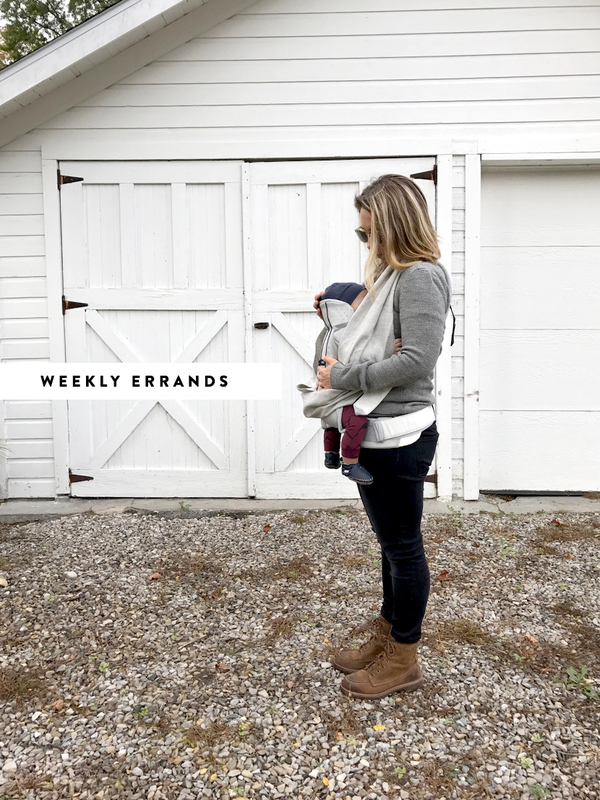 We are trying to figure out how to show you these wardrobes, but for now, we figure you can start putting the pieces together of the items that are staples in our closet by seeing how we put them to use every other week. So, without further ado here is what I wore this week from Saturday to today! Now Sunday is for being home and cozy especially when it gets a little stormy outside. I love spending Sunday being lazy around the house, going for a hike, and just reenergizing for the week ahead. I am not someone who likes to plan much on these days. 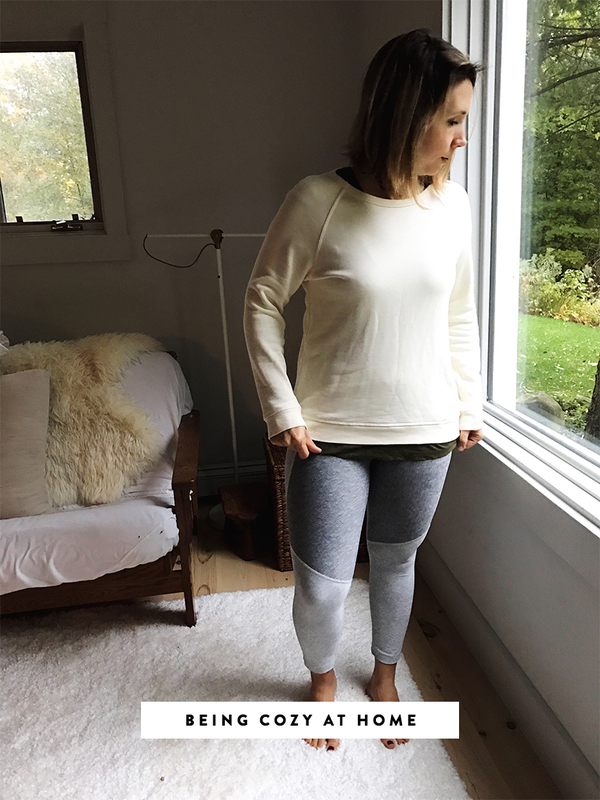 So, I wear my favorite leggings and a warm sweater to keep me warm from head to toe. 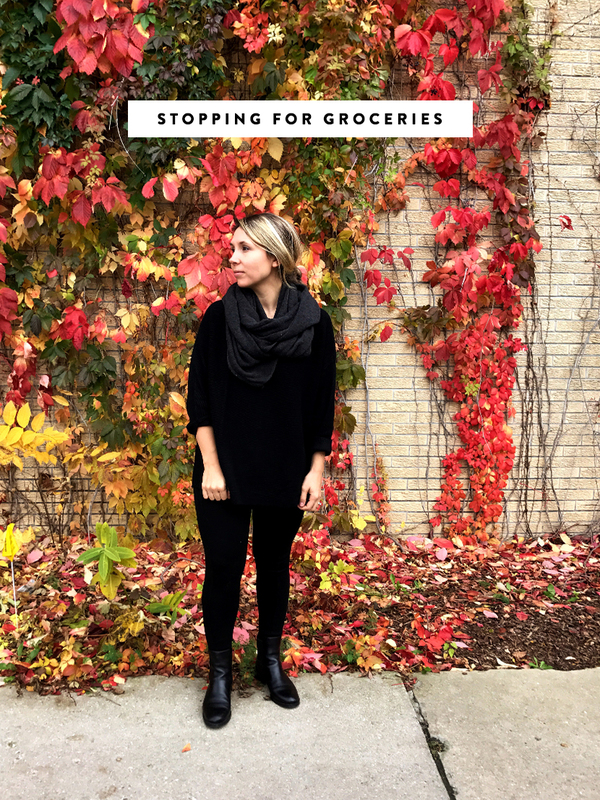 We always try to choose one day a week to run errands because we live about 20 -25 minutes outside of town. It usually means a whole afternoon affair so we dress for the occasion. We try whatever way to get Hayes to sleep while we run the errands, which is either the car seat or the carrier. This week it was the carrier while walking and waiting for the Secretary of State to open. Thankfully the neighborhood around the office is extra cute in Suttons Bay. 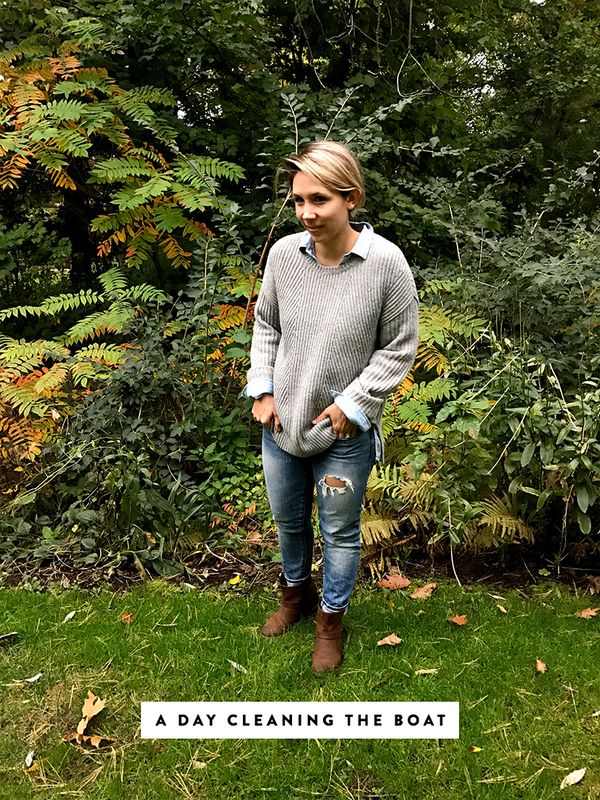 This week I wore my trusty hiking/work boots from Frye and comfy skinnies with a warm wool sweater from Zady because it was oddly between comfortable and rainy cold. So this aligned as the perfect outfit. I also usually wear something that makes it easy to slip on the carrier because I never know when it will be a possibility. More and more I have been having chances to slip away for running errands and meeting friends at least once a week. I need these moments as someone who deeply values alone time especially when it comes to my creative process. 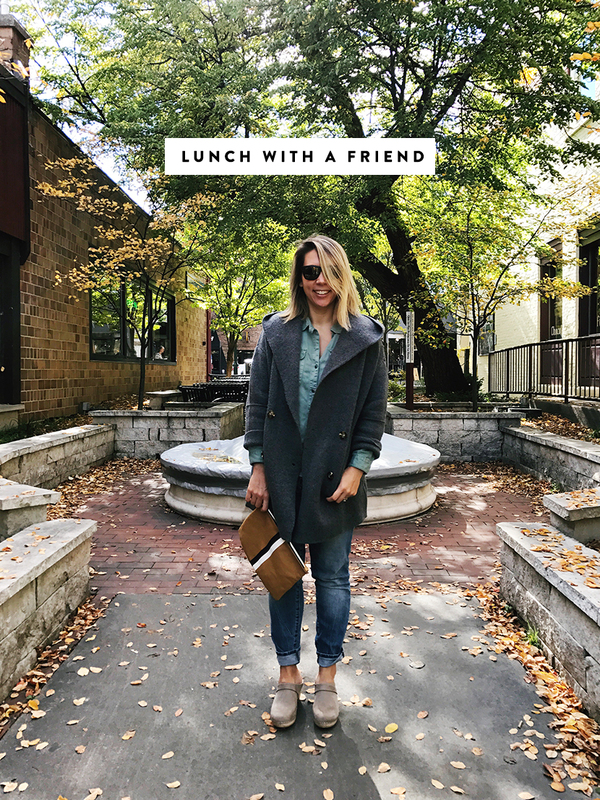 That said, I loved having a chance to run to the farmer’s market, stop into a favorite shop, and nab lunch with my friend Mae Stier (who also grabbed Wednesday’s outfit photo). The day began cool and then ended on the warm end so of course layers were necessary. So I paired an oversized sweater in a lighter knit with a cotton button down with favorite jean and clogs. Very simple but the perfect relaxed combo for errand running on a day where the weather is a little in-between. 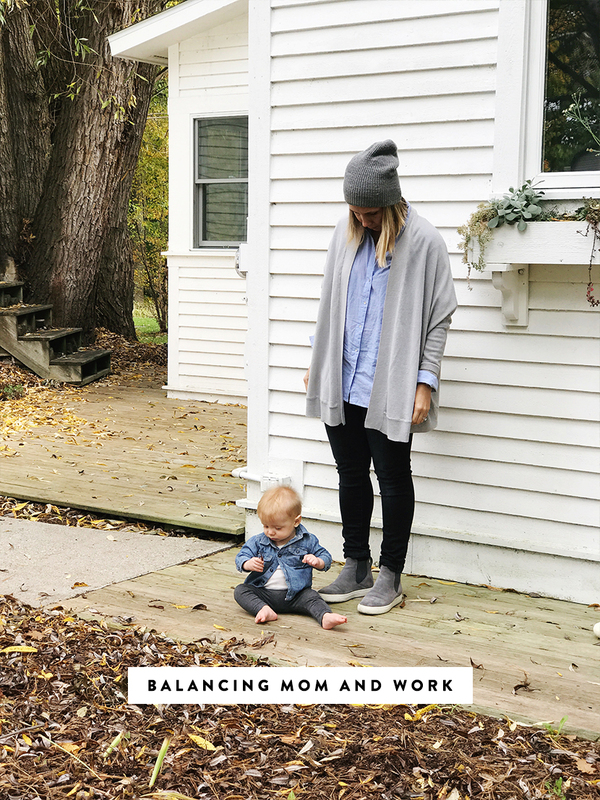 This is what I spend most of my week doing working to find a healthy balance of being a mom and working. Both two things I am extremely passionate about. I could write post after post about this balance and I plan to. It isn’t till now that I feel in some way there is something relative to a balance of any kind. Not perfect, but we are starting to have some serious barrings on this whole co-parenting and running of a business. But that isn’t what you reading this post for…haha. That’s for another day. But what do I wear for most of the week? This kind of outfit. I wear my favorite comfy jeans (I referenced them in the last post of what I wore). I then wear something that makes it easy to feed Hayes on some level either loose and flowy or button front. Though he is no longer 100% breastfed he still gets about 3-4 feedings during the day from me so I have to be prepared, but at this point it is second nature. I then typically pull on a hat on days when showering isn’t a total option or won’t happen till later in the day. It works really well on these cooler days too. Plus, I love the way slouchy beans offer that tomboy look. I then wear my favorite sneakers of course! I cannot be without these things. Final look for the week was what I wore yesterday to stop for some groceries at our local co-op after a doctor’s apt. Someday I will show you guys my closet, but if I told you that I predominately have gray and black in my wardrobe would you be surprised? After spending a month in Paris, I came to terms with the fact that I am a neutrals lover and that that is 100% okay. After growing up in a culture of the women around me wearing bright colors and patterns, I thought that was what I had to fit into, but I have realized that isn’t me and many times you will see me wearing all neutrals and basic tones and sometimes all together. It is me. My favorite is when I can wear an oversized sweater, thick black leggings (my favorite are from Zara) and a pair of Chelsea boots. Super comfy and warm on crisp days, but awesome for getting around and getting things done while still being stylish and put together. Plus, when you have a baby wearing black is the best cause it hides the large amounts of drool, food, and more than you find yourself being coated with at the end of the day. Thanks!!! Have an awesome day! I love so much your style, megaN! Thanks for share.